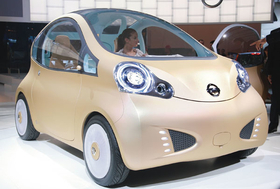 The Nuvu concept previews Nissan's vision for an electric city car. The concept was unveiled at the 2008 Paris auto show. PARIS -- Nissan is seeking European Investment Bank financing to help it develop electric cars that it will sell starting in 2012, a senior executive said. The Japanese carmaker is also seeking EIB loans for research on small, fuel-efficient engines and to boost productivity at its Barcelona, Spain, factory, Eric Nicolas, Nissan's senior vice president finance and administration said. "I need money to survive and we are not going to get it from the banks at the moment," Nicolas said. Nissan has held two high-level meetings in recent months with the Luxembourg-based EIB. The carmaker hopes to see an initial injection of low-cost financing before year-end, Nicolas said. Nissan has told the EIB that it needs help towards the billions of euros it will cost to fund the European elements of its global electric vehicle project, which is being coordinated with French alliance partner Renault. Renault has applied for 400 million euros of EIB financing for its electric vehicle project. The funding could be approved in the coming months, EIB sources told Automotive News Europe. Failure to win EIB financing could force Nissan to suspend some European r&d or purchasing activities, Nicolas said. Nissan's eventual decision on whether to manufacture batteries and electric cars in Europe and continue future r&d programs here will also be linked to the availability of public finance. "That's really what's under discussion," Nicolas said.